Reservations are available by calling (570) 966-5400. The past lives on in this classic establishment. With the onslaught of new restaurants built every year, it’s almost a rarity to find ones that wish to preserve their history. Yet when you do, you often find unique character that cannot be matched by many of the newer establishments. And when that character has an even deeper history, it offers more allure. Such is the story behind the Mifflinburg Hotel & Scarlet D Tavern. 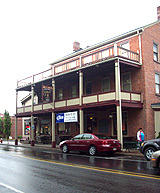 A gentleman named Jacob Decard constructed the Mifflinburg Hotel in 1858 on the site of the former Stiltzer Hotel. Around 1915, it became a temperance hotel for a short time during the Prohibition years. A devastating fire pretty much destroyed the hotel just one year later but luckily the interior was restored and even a balcony added to the front of the building. In the 1920’s Agnes Guyer and her daughter, Hannah Kistler, supervised the business. Under their management, the hotel earned a reputation within the community and outlying regions for the fine dining that one could find there. For the remainder of the century the structure fluctuated between a hotel/restaurant, banquet facility and boarding house. But unfortunately the many years of neglect and disrepair finally led to the Hotel’s closing in 2003. In September of 2004, Norman E. Buck of Watsontown, PA purchased the aging establishment. Just two short weeks after the purchase, Norman met with an untimely death that once again put the future of the hotel in jeopardy. Fortunately the Buck family decided to follow through with Norman’s desire to acquire and restore the wonderful building and fledgling business. The Buck family had already purchased and renovated two other nearby properties, The Watson Inn in Watsontown and The Lewisburg Hotel in Lewisburg. Both of these had undergone major restorations that turned them into beautiful and successful businesses. In keeping with their mission of honoring Norman’s desires, extensive renovations soon began. And in January of 2007, nearly two years after the renovations began, the hotel reopened with its original luster making the hotel once again a focal point for the town of Mifflinburg. The newly remodeled establishment has 18 hotel/motel rooms that reflect the classic Victorian style with modern amenities. The restaurant offers lunch and full dinner menus in four dining areas and banquets can be held for up to 90 people. The Scarlet D Tavern, fondly referred to by locals as “the D”, boasts a unique two-story bar and two giant screen TV’s. The tavern has 11 different draught beers and a great selection of imported and domestic beers. The addition of live entertainment and nightly specials make the “D” the place to be in Mifflinburg. An area called "Bucky’s Den" was also part of the remodeling plan but has since then been named the Scarlet D Game Room. Live entertainment has been a part of the tavern for a long time. In the late 80’s and early 90’s, a band that played there wrote a song about ghosts that have long been rumored to inhabit the hotel. Ghost seekers have since them come to stay at the hotel in hopes of finding out firsthand if the rumors were true. A unique feature of the tavern is the various encased guitars that are in glass cases around the interior of the bar area. The brother of Johnny Cash, signed one of these guitars but another is the last guitar that Johnny Cash ever signed himself. General Manager Rick Buck's father also played guitar in a country band called “Bucky & the Good Tymes”; his guitar stands proudly among these famed country legends. Today, Rick carries on the tradition playing and touring internationally as “The Cash Crew” as Tommy Cash’s back-up band. And if you’re wondering if he’s related to the late great Johnny Cash, he is; he’s his little brother. Both the restaurant and tavern feature menu specials designed around specific events and holidays. More information on this and their live entertainment can be found by contacting the hotel or restaurant at (570) 966-5400.